Hugh Fearnley-Whittingstall's roasted eggplant 'boats'. 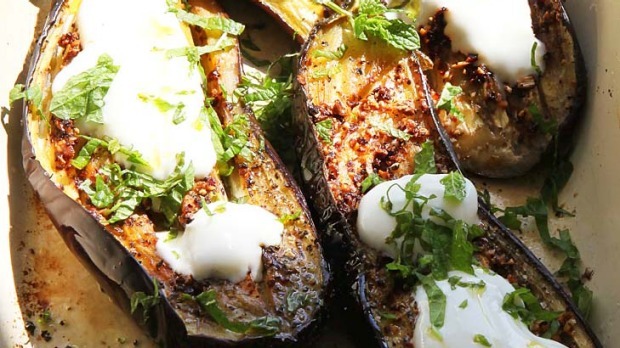 This is a really simple but delicious way to cook aubergines. Usually I serve them with fresh mint and yoghurt, but I’ve also tried smearing them with a little home-made pesto, which is lovely. To make a meal of them, serve alongside a simple couscous salad, or just a green salad and some hot flatbreads. Preheat the oven to 190°C/Gas Mark 5. Cut the eggplants in half lengthways. Using a small, sharp knife, make a series of deep slashes diagonally across the flesh, going about two-thirds of the way into the flesh, but not right through to the skin. You want to end up with 6–10 slashes, 1–2cm apart, depending on the size of your eggplants. Mix the garlic and chilli with 3 tablespoons of the olive oil. Hold one eggplant half in your hand and squeeze it from side to side so the slashes open up a little. Spoon some of the garlic and chilli oil over the eggplant with a teaspoon, using the back of the spoon to work the oil down into the slashes. Repeat with the other halves. Put the eggplant halves, flesh side up, in a roasting dish. Sprinkle with salt and pepper, then trickle over a little more olive oil – there should be little or no un-oiled flesh showing on each eggplant half. Roast in the oven for about 50 minutes, or until a deep golden brown and considerably reduced in size. Leave the eggplants to cool slightly. Serve them hot or warm, either dabbed with yoghurt and sprinkled with mint and a touch more salt, or smeared with a little pesto.